This protocol describes a flexible, low-cost system for measuring mouse ambulation in an open field activity assay. We show that a 6-minute ambulation assay based on this system detects a decrease in voluntary movement in mdx mice, and accurately distinguishes improvement in a muscle-specific rescue of these animals. Gibbs, E. M., Crosbie-Watson, R. H. A Simple and Low-cost Assay for Measuring Ambulation in Mouse Models of Muscular Dystrophy. J. Vis. Exp. (130), e56772, doi:10.3791/56772 (2017). Measuring functional outcomes in the treatment of muscular dystrophy is an essential aspect of preclinical testing. The assessment of voluntary ambulation in mouse models is a non-invasive and reproducible activity assay that is directly analogous to measures of patient ambulation such as the 6-minute walk test and related mobility scores. Many common methods for testing mouse ambulation speed and distance are based on the open field test, where an animal's free movement within an arena is measured over time. One major downside to this approach is that commercial software and equipment for high-resolution motion tracking is expensive and may require transferring mice to specialized facilities for testing. Here, we describe a low-cost, video-based system for measuring mouse ambulation that utilizes free and open-source software. Using this protocol, we demonstrate that voluntary ambulation in the dystrophin-null mdx mouse model for Duchenne muscular dystrophy (DMD) is decreased relative to wild-type mouse activity. In mdx mice expressing the utrophin transgene, these activity deficits are not observed and the total distance traveled is indistinguishable from wild-type mice. This method is effective for measuring changes in voluntary ambulation associated with dystrophic pathology, and provides a versatile platform that can be readily adapted to diverse research settings. Reliable and reproducible measurements of muscle function are critical for evaluating the efficacy of potential therapies for DMD. DMD is a genetic disorder caused by mutations in the dystrophin gene, leading to progressive muscle weakness, loss of ambulation, and eventual cardiorespiratory failure. The most widely used animal model of DMD is the dystrophin-null mdx mouse. A battery of functional tests have emerged as routine assays for evaluating disease progression in the mdx mouse as well as in similar animal models of other dystrophies and myopathies. Commonly used in vivo assays include measurements of forelimb grip strength, wire hanging time, rotarod maximum, time to exhaustion during treadmill running, and motor activity tracking. There has been a substantial effort in the field to standardize these tests, with the goal of reducing variability between preclinical studies and increasing the translational potential of therapeutics tested in mice1,2. One important category of preclinical testing is the measurement of voluntary movement, a parameter that is frequently altered in murine models of muscular dystrophy. This is usually tested by assays based on open field activity monitoring, and may evaluate either horizontal (walking) or vertical (rearing) movements over a course of minutes or hours2,3,4. A number of studies have shown voluntary movement to be altered in mdx mice, particularly after exercise, and these measurements have been shown to be sensitive to drug treatment and disease progression. One major limitation in performing these assays is the need for specialized, high-cost equipment. Here, a low-cost method that tracks mouse ambulation using readily available resources is presented. The 6-minute walk distance is a metric commonly used as a clinical assessment tool in individuals with Duchenne muscular dystrophy5,6. Modifications of this measure have been used to assess outcomes in animal models of Duchenne, including mdx mice7 and golden retriever muscular dystrophy (GRMD) dogs8. In this study, we record voluntary open field movement in the 6 minutes immediately following a mild exercise challenge. Ambulation distance was then calculated using free open-source software to measure horizontal movement over time. The main advantage of this method is that animals can be tested in a variety of settings without needing specialized equipment or high-cost commercial software for analysis. One important aspect of this analysis is that it can be performed in a basic laboratory setting without needing to move or transfer mice out of the vivarium to a specialized core facility. The video-tracking protocol described here is well-suited to the assessment of ambulation over relatively short time-periods and can detect activity differences between wild-type and mdx mice, as well as reveal functional improvement in a rescue model of DMD. The methods described here were approved by the Institutional Animal Care and Use Committee at the University of California, Los Angeles. Wild-type (C57BL/6J) and mdx mice (C57Bl/10ScSn background) were purchased from a commercial source. mdx:utrophin-Tg mice were a gift from James Ervasti, with permission from Kay Davies, and were maintained on the mdx background. Ambulation assays were performed on male mice at 6 months of age. Mice were maintained in the Terasaki Life Sciences Vivarium following guidelines established by the Institutional Animal Care and Use Committee at the University of California, Los Angeles (approval #2000-029-43) and approval for these studies was granted by the UCLA Animal Welfare Assurance (approval #A3196-01). Perform data collection in a quiet, temperature controlled room at a consistent time of day9. Perform the tests blinded to the genotype and treatment of the mouse being tested. Adapt any open field chamber system for this analysis. NOTE: In this study, we use an inexpensive and easily transportable recording chamber constructed from a large trash bin. The open field arena is a tray set on a cage or similar elevated platform. Place the camera on a wire mesh above the chamber to record across the full arena. Clean the recording chamber with disinfectant before each trial. Optionally, immediately prior to activity recording, challenge each mouse with a muscle activation protocol. NOTE: This is optional but recommended in experiments involving mdx mice. Allow the mouse to grip the pull bar of a digital force gauge and gently pull back until the pull bar is released. Repeat this procedure five times per trial. Record peak tension (N) for each trial. NOTE: In addition to serving as an exercise challenge for the ambulation assay, the force exerted by the animal during this grip strength assay can be used as an additional functional outcome measure2,10. Perform five total trials for each mouse with 1 min of rest between each trial. Immediately following the grip strength assay or other exercise protocol, place the mouse in the activity chamber. Start the video recording of the movement of the mouse in the chamber arena. Allow the mouse to freely explore for 6 min. Stop the recording at 6 min and return the mouse to its home cage. Optionally, prepare video for analysis by reducing the frame rate. In order to reduce the frame rate for tracking analysis, use the following protocol in a video editing software (e.g., iMovie or similar program) to decimate the video frame rate by a factor of 2. NOTE: Depending on length and frame rate of the video, it may be useful to reduce the video frame rate prior to analysis. In this study, video was recorded at 30 frames/s (6 min recording, approximately 10,800 frames total). Load the video into the software. Under the 'Speed' menu, select 'Speed: Fast' and set speed to 2x. Export the decimated video in .mp4 file format for tracking analysis. Open the video for analysis in the software program. Set the calibration for the video recording by using the line tool. Draw a line along one side of the chamber. Right click on the line and select "Calibrate measure…" Enter the actual size of the chamber side in centimeters. To begin semi-automated tracking of the mouse position, click on the 'move' cursor. Starting at the initial frame in the video, right click on the point to be tracked; the tracking point is marked with a blue circle. NOTE: In the present study, the position of each animal was tracked by tracing the base of the tail. Advance the frame by clicking the right arrow on the keyboard; the tracking point should automatically move based on the position of the tail base. If the tracking position is not aligned with the point of interest in a given frame, manually align the blue circle to the base of the tail. NOTE: Depending on the quality of the video and the speed of the mouse, the tracking may require variable levels of user input to maintain alignment with the point of interest. The path of the mouse should advance through the course of the video. When tracking of the full video is complete, save the video and tracing overlay. Export the positional data of the tracing by selecting "Export to Spreadsheet". Open the positional data in a spreadsheet software program. The movement analysis software reports the X,Y coordinate position of the mouse in each frame. NOTE: Cumulative distance over time can be calculated by adding the distance traveled between each frame. Variations of the open field assay have been shown to be an effective method to test the disease progression in models of muscular dystrophy. 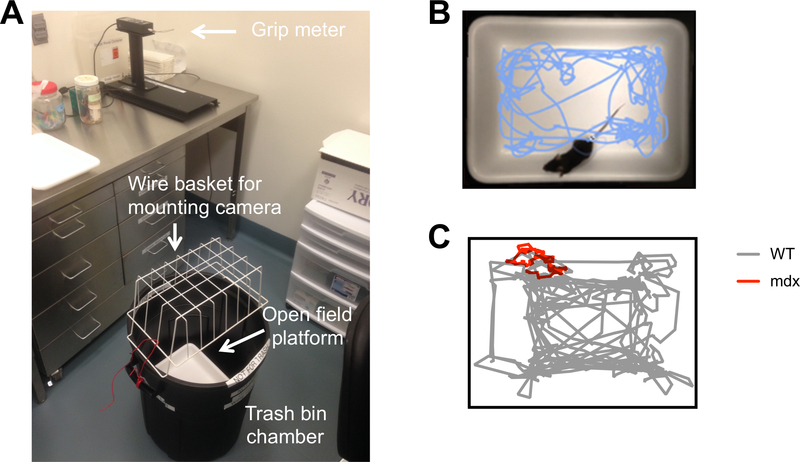 Here, we demonstrate a versatile video tracking method for the analysis of two-dimensional mouse movement using readily available recording equipment and open source software (Figure 1A-B). Consistent with results reported from similar assays, we show that mdx mice challenged with an exercise protocol immediately before testing show significantly less voluntary movement in a 6-minute open field task than wild-type mice (Figure 1C, Figure 2). Following the mild exertion of a grip strength challenge, mdx mice typically remain still for the first few minutes of the ambulation protocol, with a modest increase in movement by minute 4 to 5 (Figure 3A). When testing wild-type and mdx animals without an exercise challenge, we detected no difference in total distance traveled (Figure 2). This is consistent with reports from other groups looking at similar movement assays, with unexercised mdx showing no difference or small decreases relative to wild-type mice. We additionally evaluated transgenic mice expressing high levels of utrophin in order to test the sensitivity of our assay (mdx:utr-tg, Fiona line)11,12. The mdx:utr-tg is a robust rescue model of the mdx phenotype with few dystrophic features. Following exercise, mdx mice expressing utrophin were indistinguishable from wild-type, with no significant difference in the total distance traveled (Figure 3B) or at any of the cumulative time points measured (Figure 3A). Video-based tracking relies on frame-to-frame variability, measured by either manual observer scoring or by automated software detection. Free and open source movement analysis software allows for semi-automated detection of animal movement, in which undetected or overestimated movements can be manually corrected as the activity trace is generated. To minimize the data processing in this assay, we downsampled the original videos from the recorded 30 fps to 15 fps. To determine the effect of decreasing the sampling rate, we measured the total distance traveled from 1 min of full frame rate video and then compared distance measurements derived from downsampled versions of the data set (Figure 4A). We found that reducing the frame rate by half (decimation by 2) decreased the measured distance by 5.0%, and reducing the frame rate as low as 7.5 fps retained nearly 90% of the original distance calculated (89.2% of distance from 30 fps video). The accuracy of measured distance dropped off sharply after this point, although even highly-decimated datasets still closely approximated the path of the animal (Figure 4B). These observations highlight the importance of considering frame rate and signal processing in assessing animal activity, and demonstrate that high spatial resolution can be retained in downsampled video data. Figure 1: Representative open field traces of 6-minute ambulation distance. (A) Set-up of activity recording chamber used in this study. Grip meter was used for exercise challenge prior to assay, then free ambulation was recorded on the open field platform. (B) Composite image of 6 min video recording with tracing analysis in movement tracking software. (C) Overlay of two representative traces (WT, grey, n = 1; mdx, red, n = 1). Please click here to view a larger version of this figure. Figure 2: Effect of exercise on mdx ambulation. 6-minute ambulation distances were recorded at 6 months of age with or without prior exercise (non-exercised mdx n = 5, WT n = 4; exercised mdx n = 5, WT n = 5). No significant difference was observed between WT and mdx when unexercised, but a significant difference was seen in mice exercised prior to assay (no exercise: WT 1077.0± 106.4 cm, mdx 971.0 ± 36.16 cm; post-exercise: WT 770.2 ± 30.75 cm, mdx 127.8 ± 36.16 cm). Data represent means ± SEM. Statistics calculated using two-way ANOVA followed by Tukey's multiple comparison's test (*p < 0.05, **p < 0.01, *** p < 0.001 and ****p < 0.0001). Please click here to view a larger version of this figure. Figure 3: Transgenic expression of utrophin improves ambulation in mdx mice. 6-minute ambulation distances were recorded at 6 months of age using an open field activity chamber (WT n = 5, mdx n = 5, mdx:utr-Tg n = 4). (A) Cumulative distance traveled by minute. No significant difference was detected between WT and mdx:utr-tg at any point. Statistics calculated using two-way ANOVA followed by Tukey's multiple comparison's test (*p < 0.05, **p < 0.01, ***p < 0.001 and ****p < 0.0001). (B) Total open field distance traveled over 6 min (WT 770.2 ± 30.75 cm, mdx 127.8 ± 36.16 cm, mdx:utr-Tg 701.3 ± 33.54 cm). Data represent means ± SEM. Statistics calculated using one-way ANOVA followed by Tukey's multiple comparison's test (*p < 0.05, **p < 0.01, ***p < 0.001 and ****p < 0.0001). Please click here to view a larger version of this figure. Figure 4: Effect of sampling rate on ambulation tracking. In a wild-type mouse, 1 min of ambulation distance was recorded and tracked using movement tracking software at full frame rate (30.0 fps, 1,819 total frames). The two-dimensional position of the mouse in each frame was determined, and these data were then decimated to simulate tracking in lower frame rate video (30, 22.5, 20, 15, 10, 7.5, 6, 3, 1.5, and 0.75 fps). (A) Total distance calculated from coordinates in each downsampled data set. Dotted lines show values within 5% of the distance calculated from the full frame rate video. Data in this study were obtained from video decimated to 15 fps (red arrow). (B) Overlays of traces comparing full frame rate tracing with 1.5 fps (above) and 15 fps (below). Please click here to view a larger version of this figure. The open field assay provides an effective and non-invasive way to test motor function in mouse models of muscle disease, and variations of this assay can serve as a valuable endpoint measure for pre-clinical studies. One major limitation with this type of assay is the high-cost and limited accessibility of activity monitoring systems. In this study, we demonstrate a low-cost system for open field activity analysis that can generate similar results to existing commercial software and equipment. This system can be used within vivaria where mice are housed, eliminating the need to transfer animals to core facilities. The versatility of this assay also enables the use of video tracking in a wide variety of research and educational settings, including undergraduate laboratory courses focused on animal physiology and behavior. 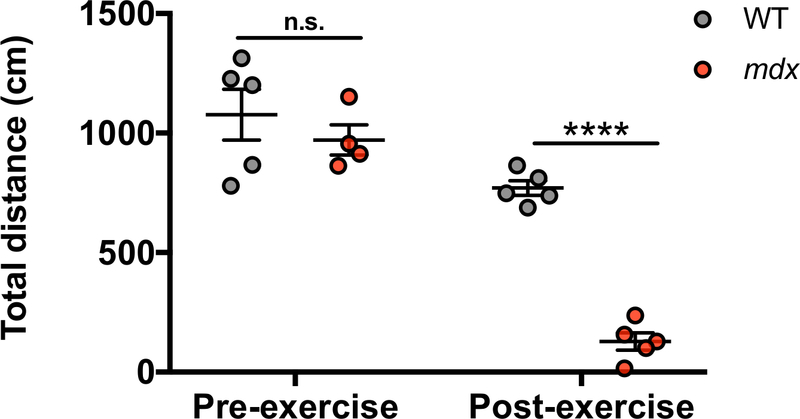 In this study, we found that differences in voluntary movement between wild-type and mdx mice can be readily detected following exacerbation by exercise. This robust difference has been reported by other groups looking at similar activity outcomes, including hour-long open field assays and overnight rearing assays. While we observed no difference in voluntary ambulation between unexercised wild-type and mdx mice, this is consistent with results from other groups13. Some researchers have reported a modest difference in voluntary ambulation distance between unexercised wild-type and mdx mice7, while others report no difference13. Our findings support the use of muscle activation prior to testing in order to reliably detect a statistically significant difference in mdx activity. In this study, we presented mice with a novel open field environment. Using this novel environment protocol, we observed very little variability within groups. However, when mice are placed in an unfamiliar environment, they tend to have heightened activity14. If the same animals are to be tested across multiple sessions, animals should be habituated to the recording chamber and undergo the full test protocol multiple times before recording data. One important consideration in evaluating data from open field assays is that it is highly sensitive to animal behavior and emotional conditions, particularly anxiety-like behaviors. It is possible that the mdx may have a different behavioral response to the novel environment than the wild-type control animals. However, we additionally tested a muscle-specific rescue, the mdx:utr-Tg mouse, which expresses utrophin under a muscle-specific promoter. These mice performed as well as wild-type animals, suggesting that any behavioral differences in mdx mice are not driving the changes in voluntary ambulation. Open field assays are widely used in behavioral paradigms as well as in studies of motor function, and there are a variety of parameters that can be recorded from activity monitoring systems. Some of these measurements commonly used in commercial activity analysis software include the automated detection of specific behaviors, turn frequencies, vertical movement, and preferences for specific regions of interest. For the 6-minute ambulation distance assay used in this study, the output is largely limited to distance and speed of horizontal ambulation. Additionally, due to the level of user input required for semi-automated tracking in this protocol, this assay would likely not be well suited for activity monitoring for longer periods of time or measuring multiple animals in parallel. In this study, we found that a trained user could process and extract data from videos in approximately 15-30 min per recording. While this represents only a moderate time burden for small-scale experiments, this level of analysis would rapidly become prohibitive for studies looking at large sample sets over a longer time period. While more fully automated commercial tracking systems typically cost more than 20,000 USD, these solutions may be more cost- and time-effective for laboratories where ambulation is frequently tested. However, for laboratory and educational settings that only test small numbers of animals, the simple set-up and reproducibility of this assay provides a valuable tool for assessing motor behavior. The types of data analyses available are an important consideration in determining appropriate endpoint assays for a pre-clinical study. While we were able to consistently detect differences between three genotypes using 6 minute ambulation distance (wild-type, mdx, and mdx:utr-tg), a more complex analysis of longer-term activity may be desirable when looking at subtle changes in voluntary movement. However, the accessibility and simplicity of this low-cost set-up make it a useful and highly relevant functional test for pre-clinical studies in the mdx mouse model. This work was supported by grants from the National Institutes of Health [R01 AR048179 and R01 HL126204 to R.C.W, T32 AR059033 and F32 AR069469to E.M.G] and the Muscular Dystrophy Association USA [274143 and 416364 to R.C.W.]. Roughneck 32 Gallon Black Round Trash Bin (Open field chamber) Rubbermaid # 1778013 Any open field chamber system can be adapted for recording. This study uses a recording chamber constructed out of a tray on a platform, at the bottom of a large trash bin. Avant White Plastic Tray 15"W x 10"D x 1.45"H (Open field chamber) US Acrylic, LLC Any open field chamber system can be adapted for recording. This study uses a recording chamber constructed out of a tray on a platform, at the bottom of a large trash bin. Nagaraju, K., Carlson, G., De Luca, A. Behavioral and locomotor measurements using open field animal activity monitoring system. TREAT-NMD SOP Number M2.1.002. 2. 2, (2010). Tatem, K. S., et al. Behavioral and locomotor measurements using an open field activity monitoring system for skeletal muscle diseases. J Vis Exp. (91), e51785 (2014). Kobayashi, Y. M., et al. Sarcolemma-localized nNOS is required to maintain activity after mild exercise. Nature. 456, (7221), 511-515 (2008). Belanto, J. J., et al. Microtubule binding distinguishes dystrophin from utrophin. Proc Natl Acad Sci U S A. 111, (15), 5723-5728 (2014). McDonald, C. M., et al. The 6-minute walk test in Duchenne/Becker muscular dystrophy: longitudinal observations. Muscle Nerve. 42, (6), 966-974 (2010). Mazzone, E., et al. Star Ambulatory Assessment, 6-minute walk test and timed items in ambulant boys with Duchenne muscular dystrophy. Neuromuscul Disord. 20, (11), 712-716 (2010). Kobayashi, Y. M., Rader, E. P., Crawford, R. W., Campbell, K. P. Endpoint measures in the mdx mouse relevant for muscular dystrophy pre-clinical studies. Neuromuscul Disord. 22, (1), 34-42 (2012). Acosta, A. R., et al. Use of the six-minute walk test to characterize golden retriever muscular dystrophy. Neuromuscul Disord. 26, (12), 865-872 (2016). Sousa, N., Almeida, O. F., Wotjak, C. T. A hitchhiker's guide to behavioral analysis in laboratory rodents. Genes Brain Behav. 5, Suppl 2. 5-24 (2006). Gibbs, E. M., et al. High levels of sarcospan are well tolerated and act as a sarcolemmal stabilizer to address skeletal muscle and pulmonary dysfunction in DMD. Hum Mol Genet. 25, (24), 5395-5406 (2016). Gillis, J. M. Multivariate evaluation of the functional recovery obtained by the overexpression of utrophin in skeletal muscles of the mdx mouse. Neuromuscul Disord. 12, Suppl 1. S90-S94 (2002). Tinsley, J., et al. Expression of full-length utrophin prevents muscular dystrophy in mdx mice. Nat Med. 4, (12), 1441-1444 (1998). Song, Y., et al. Suite of clinically relevant functional assays to address therapeutic efficacy and disease mechanism in the dystrophic mdx mouse. J Appl Physiol. 122, (3), 593-602 (2017). Bolivar, V. J. Intrasession and intersession habituation in mice: from inbred strain variability to linkage analysis. Neurobiol Learn Mem. 92, (2), 206-214 (2009).